NEW YORK (WABC) -- Researchers in New York are now using virtual reality to delve deep inside the human body in hopes of unlocking a cure for cancer. Researchers at Weill-Cornell Medicine developed the genome sequencing software application. Doctors wear a virtual reality headset to visualize protein structures in 3D space, searching for mutations in tumors.
" You would use both of your hands to stretch it and shrink it and that would allow you to grow or shrink the model. 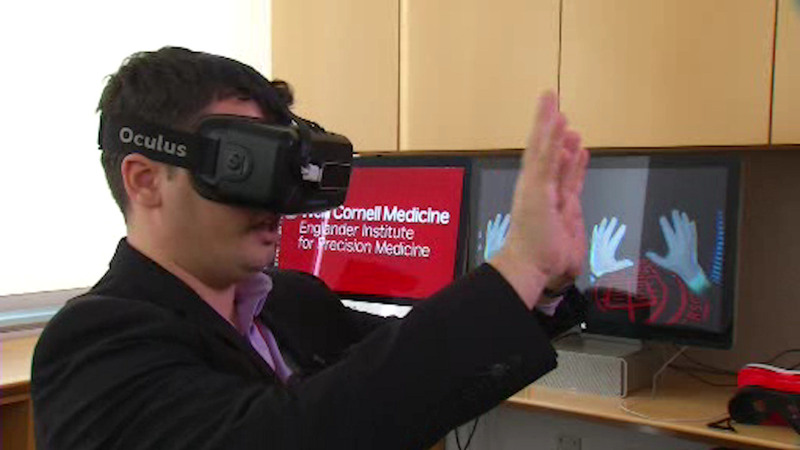 Now if I want to turn the model , I can use either my right hand or my left hand, depending on how I move it up or down or left and right and the model equally rotates," said Alex Sigaras, of Weill-Cornell Medicine. The new 3D technology is already being used by medical fellows studying tumors.